A thin cross is covered in beautiful, sparkling diamonds in this Promise of God 1/4 carat diamond cross pendant in 14K white gold from Apples of Gold Jewelry. The perfect way to wear a symbol of your faith every day, this beautiful necklace has 16 diamonds going across the entire surface of the cross, totaling 0.25 carats. The diamonds, which are G-H color rated and I1 for clarity, make quite the statement as they dazzle on the cross pendant. The pendant measures 3/4 inch tall and 0.55 inch wide, and has a hidden bale behind the cross. "He staggered not at the promise of God through unbelief; but was strong in faith, giving glory to God;" (Romans 4:20). 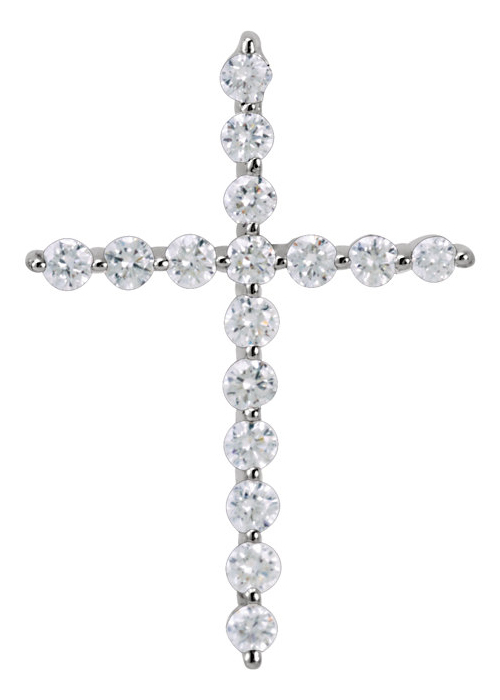 We guarantee our The Promise of God 1/4 Carat Diamond Cross Pendant to be high quality, authentic jewelry, as described above.